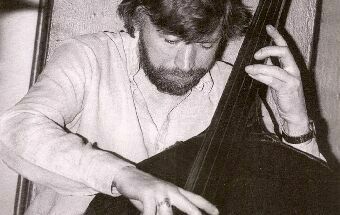 Jazz writer Alan Fordham said of Ron Mathewson's bass playing: "...graceful phrasing, unerring pitch and immaculate time, qualities that impart to the instrument a lithe and elegant character quite different to the ponderous one it has in some hands..."
Double bass player Ron Mathewson was born in the Shetland Isles, Scotland in 1944 and began studying classical piano at the age of eight. At the age of fifteen he got an unexpected opportunity to play a double bass at a festival dance in the Shetlands when the band's bass player became unwell. His parents had hoped he would become a concert pianist but he gave up the piano and took up the bass. "My first experience was with "trad" jazz and in 1962 I was working with the Clyde Valley Stompers, then based in London, and I followed this with a couple of spells with the Alex Welsh Band. I was on a cruise with them in 1966 when I heard that pianist Mike Pyne had recommended me to Tubby Hayes who was looking for a replacement bass player". To somebody unfamiliar with modern jazz chord changes and Tubby's furious tempos this could have been a daunting challenge but Mathewson learnt fast and in the second half of the 1960s he worked with Tubby's Quartet and Orchestra and made a number of memorable records including "Mexican Green", (details below), which he reckons is his favourite of all the records he made. He continued to work regularly with Tubby until Tubby's death in 1973. In the late 1960s and early '70s Mathewson was a popular figure with the jazz public being voted into a high place in the Melody Maker Readers Polls - 1967 (3rd), 1968 (2nd), 1969 (3rd), 1970 (2nd) and 1974 (joint 1st). He began to work with top names besides Tubby, including Dexter Gordon, Bill Evans, Philly Joe Jones, Ray Nance, Stan Getz and Oscar Peterson. He recorded with Phil Woods and his European Rhythm Machine in the early 1970s. Other achievements included a spell with the Francy Boland / Kenny Clarke Big Band with whom he recorded a number of albums in 1969 and he recorded again with the Francy Boland Big Band in 1976. The band often worked with two drummers and Matthewson recalls "It was difficult to keep time - there was a lot going on". Ron Mathewson began a long association with Ronnie Scott in 1976. He had worked with Scott in his short lived octet that lasted a few months in 1968. Many people thought that the group never reached it's full potential but fortunately it was recorded in 1968, (details below). In 1978 Ronnie recorded "Serious Gold", (details below), an album that was widely thought to be his best album and again Mathewson was present as he was for Ronnie's last record "Never pat a burning dog" in 1990, (details below). He left Ronnie Scott in 1992 after sixteen years "I had been trying to quit for a long time, but Ronnie wouldn't have it. I was exhausted and needed a break - I had become a heavy drinker and smoker and in the end I had to get Ronnie to fire me or I would never have got away". After breaking from Ronnie Scott, Mathewson did some commercial work including a spell with a jingle writing firm but his interest in jazz was over. He did some teaching including a summer school in South Wales but has never had the urge to pick up the bass again. John Fordham writing in Jazz News in 2007 said "He feel he's had a priviliged life as an internationally respected jazz musician who had years as one of the world's best... " Mathewson himself says "I've got boxfuls of cinefilm and videos of the bands I played with and I've got wonderful memories. I never thought jazz would be my life when I was young but I've never regretted for a minute that it has been". Tubby Hayes (ts,fl-1), Mike Pyne (p), Ron Mathewson (b), Tony Levin (d). Dear Johnny B*/Off The Wagon*/Trenton Place-1*/The Second City Steamer*/Blues In Orbit*/A Dedication To Joy*/Mexican Green*. Realm LP titled "Live" at Ronnie Scott's.....CBS titled "Ten years at Ronnie Scott's". Kenny Wheeler (tp,flhn), Chris Pyne (tb), Ray Warleigh (as,fl), Ronnie Scott (ts), John Surman (bs,sop), Gordon Beck (p,org), Ron Mathewson (b), Kenny Clare, Tony Oxley (d). Ricorda Me#*/King Pete*/Second Question*/Marmasita*/Too Late, Too Late*#/Lord Of The Reedy River*/Macumba*/May Day*/Sweet Day*/Quiet Nights*/Hank's Tune*. Ronnie Scott (ts,sop), John Taylor (keyb), Louis Stewart (g), Ron Mathewson (b), Martin Drew (d). Invitation/Lazy Afternoon/Forty Colours/Hey-Oke Suite Ballad/Send In The Clowns/Interfusion. This page was last updated during April, 2010.